Devon has stolen my heart. This year I have made 3 trips to Devon and I adore the drive from London to Devon, past gorgeous scenery, rolling hills, wild ponies and through country lanes. It makes you forget all your worries and relax. Such was the drive for our recent countryside escape to North Devon, where we were staying at the stunning Kentisbury Grange hotel, a luxury boutique hotel located near Barnstaple, on the edge of Exmoor National Park. We arrived at a grand manor house surrounded by outstanding natural beauty all around and that fresh air that you just don’t get in London. I instantly felt happy and was looking forward to a wonderful weekend at the hotel. Check in was smooth, the staff were so lovely and our room was one of the suites on the first floor, and it overlooked the beautiful gardens. Waiting for us in the suite was a chilled bottle of Michael Caines Blanc de Blanc Champagne, which was such a lovely gesture and which we enjoyed. The room was absolutely massive with a serene view. It was modern in design and decorated in hues of purples, silver and beige and quite frankly I didn’t want to leave! It had everything you could need, including a coffee machine, which is so important to me as I love making a coffee first thing in the morning, and so this was truly appreciated. There were even some homemade biscuits in a jar which we did tuck into, which were absolutely delicious. It had comfortable chairs to relax on and thoughtfully a range of magazines to read, as well as a desk area and a cosy fireplace. The bed was large and super comfortable too. The bathroom was even more impressive – it was super spacious with a roll top bath AND a shower, as well as 2 sinks, so we could have one each. There was ample towels and bathrobes provided, and the bathroom had underfloor heating which was amazing especially as it was a little chillier in the evening. I love it when there are decent toiletries provided and so was very pleased to find some by Aromatherapy Associates. It just makes the experience feel that much more luxurious. Having checked out the room and taken all my photos, we were a little hungry and dinner wasn’t booked for a couple more hours and so we asked if we could have some Devonshire scones. It was past the time that afternoon tea was actually served but the hotel were so lovely that they actually still gave us a generous selection, complete with clotted cream and jam, which we happily devoured in the Drawing Room. The Drawing Room is a lovely place to relax in with its plush and comfortable sofas, cosy feel and quintessentially British decor. Our dinner was booked at The Coach House by Michael Caines, located on the grounds of the hotel, and which used to be a former Coaching House. Michael Caines is an amazing 2 Michelin Starred chef and he was actually born in Devon. We enjoyed a six course tasting menu and you can read about the whole experience here. The food was exquisite and they did also have an A La Carte menu. It is so ideal for a gourmet break as you can combine luxury living with luxury dining, and just relax and unwind. Our breakfast was also at The Coach House in the morning and we could choose from either the continental selection or order from the food menu, which we both did and thoroughly enjoyed. The grounds of the hotel are just breathtaking with greenery everywhere, ponds with ducks and views for miles of the rolling green Devonshire hills. I had such a fantastic time that I wished I had a few more nights. I know we will definitely be back as we enjoyed our stay so much. It really was the best countryside trip I have had this year and it really did enable us to switch off from the hustle and bustle of London life. The location is so idyllic, serene and the rooms are stunning, the service is excellent and the food is exceptional. It is the dream combination and the perfect rural escape with touches of luxury. 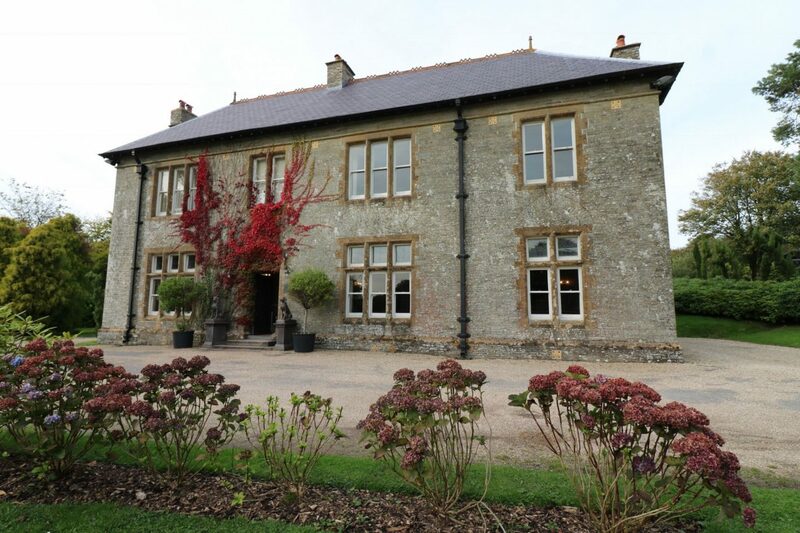 If you are looking for a lovely place to retreat to for a break I can’t recommend Kentisbury Grange enough – it is perfect for families and couples, and just so fabulous. The grounds are so beautiful I can imagine it would be fantastic for a wedding too. I have a short clip of my room tour below so you can see just how gorgeous our suite was! I was hosted by Kentisbury Grange and my stay was complimentary, but all views and photos are my own. What a gorgeous spot, Binny! How far is Devon from London by car? I really want us to go the next time we visit London! I absolutely agree with you about the importance of having a coffee machine in your room – coffee in bed first thing in the morning is a must! The room looks lovely, especially the bathroom, I love a roll top bath! Love this Binny how beautiful and tranquil. Oh Binny what a lovely getaway! !